Isn’t it interesting that clocks are so fashionable as home decor these days? After all, we no longer need them to tell the time – all we have to do is glance at your phones, laptops, iPads – or almost any household appliance -and the accurate time is right there. Or maybe that’s the reason for this current trend. 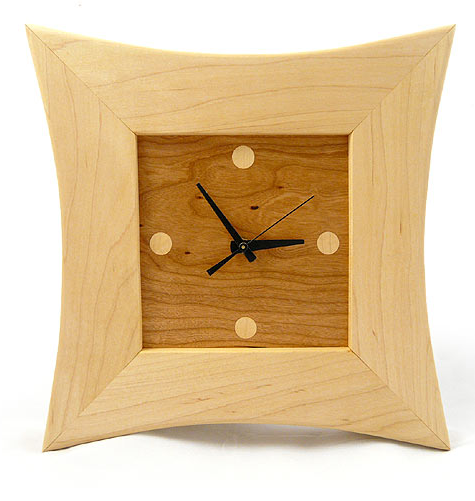 This selection of clocks has something for everyone and it’s good to know that they are handcrafted – mostly in America – using traditional methods and yet combining these with a modern design twist. All the items for sale on this site are produced in limited quantities so not only are you getting a handcrafted products for your home or office, you can enjoy it in the knowledge that very few other people have such lovely items in their homes. That makes these artisan goods perfect as a gift. Currently, these items are only shipped to the USA and Canada and you’ll find that the prices are as attractive as the objects themselves. Another good thing to know is that this unusual company donates a percentage of its profits to charities that are aiming to provide a better future for us all.